Kettlebell training is a whole body workout method that can be used by anyone. Whether you are just getting started at the gym or have a well-developed workout routine, the kettlebell provides a great cardio workout that challenges the body and uses almost all of its muscles at once. Best of all, this workout routine can be a lot of fun! A popular method of high intensity interval training, kettlebell drills are an enjoyable way to get your cardio workout in. Instead of running on the treadmill for an hour each day, try repetitive drilling with a kettlebell. Another great advantage: This non-impact training method strengthens your joints instead of putting stress on them. Not only does kettlebell training have a wide variety of benefits, but it also has an endless amount of drill combinations. Instead of sticking to the same workout every day, which can get repetitive and dull, mix things up by changing your grip and swing. A training method that consists of a variety of whole-body movements and exercises, using a kettlebell allows you to work your entire body, providing you with a great, fluid workout in a shorter amount of time than traditional methods. Instead of using sedentary machines that focus on isolated areas of the body, work with a kettlebell to build mobility, stability and strength throughout. 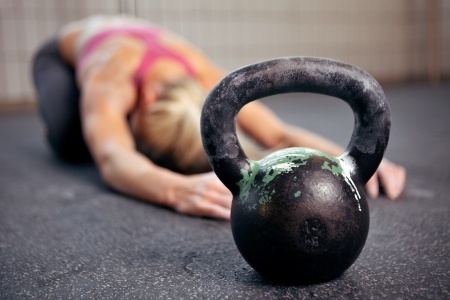 Training with a kettlebell also means you no longer have to worry about what areas you should focus on each day! Here at Fit-EST, we strive to create a positive environment for individuals who are looking to balance fitness with overall lifestyle. Take a personal training session or sign up for a class to get started on your kettlebell training routine. Contact us at 203-557-4900 or visit our Westport, Connecticut gym at 361 Post Road West to begin your fitness journey today!